2014 Ford Edge Proves To Be A Versatile Choice! People often get stuck in the decision of which SUV to buy, a large SUV for maxing cargo storage and third row capacity while some ponder upon greater fuel economy and swift movability in the city, choosing small utility vehicles, instead. Many, meanwhile, are attracted towards the middle ground choosing for a Mid-range crossover vehicle where Ford Edge echoes with the needs of most buyers. The love for Ford Edge originates from its high-tech features and attractive interiors which include blind-spot warning, adaptive cruise control, dual-screen rear entertainment system and cross-traffic alert, Sync voice-controlled system and a three-display MyFord Touch interface coupled with an easily maneuvering figure. Edge’s 265 horsepower, 3.6 L V-6 engines impresses well with the acceleration via a six-speed automatic transmission along with a road-oriented AWD configuration for slippery roads and snowy terrains, though it has been fabricated for off-roading purposes. Paying extra for a four cylinder turbocharged engine brings along a superb fuel economy of 30mpg on highway along with extra added enormous power. The electronic interface boasted well by Ford has invited itself criticism for being complex to use and miffing for users, while the restriction to seating capacity of five and no off-roading abilities may disappoint a vast buyer population. The 2014 Edge is available in SE, SEL, Limited and Sport variants. The base SE packages a V-6 engine with 17 inch alloy wheels and basic functionality feature along with an add-on convenience pack that presents benefits like exterior keypad entry, rear parking sensors, automatic rearview mirror dimming and automatic headlights along with additional satellite radio and Sync Voice Command Interface. The SEL has home for all SE features along with 18-inch alloys and 8-way power driver seat with the steering wheel wrapped with leather. Leather Comfort package adds on leather upholstery, 6-way foldable passenger seats and front seat warmers. Other options include a MyFord Touch Interface with benefits of turn-by-turn navigation. The Driver Entry Package in Limited features keyless entry and ignition, remote ignition and power liftgate apart from the basic SEL model and addition 12-speaker sound system from Sony with HD Radio and heated mirrors. The Edge Sport, alternatively bundles a 22-inch alloy wheel system with a retuned suspension, integrated special interiors and a beastier V-6 engine. For safety Antilock disc braking system, front-seat side airbags and full length curtain airbags along with stability control come standard in all models. Add-ons in the Vision package include blind-vision and cross-traffic warning system. Another option for all trim variants except sport is a 2.0 L four-cylinder turbocharged EcoBoost engine that has a 270 lb-ft of torque and produces 240 horsepower. It goes from 0 to 60mph in 8.4 seconds and furnishes a mileage of 24mpg in city with 30mpg on the highway. 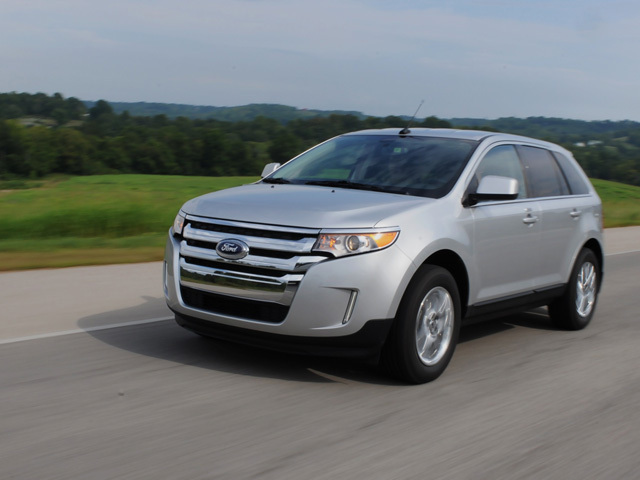 The 2014 Edge is well known for its driving comfort and quiet, soothing and bump-free ride with a solid, concrete built. Its handling is secure with all the effective safety features and cutting corners and parking is hassle-free. The sports model, meanwhile, is more swift and sharper but its husky wheelbase degrades ride quality beyond acceptance for some. Despite of the enormous V-6 engine it leaves many people craving for more power.